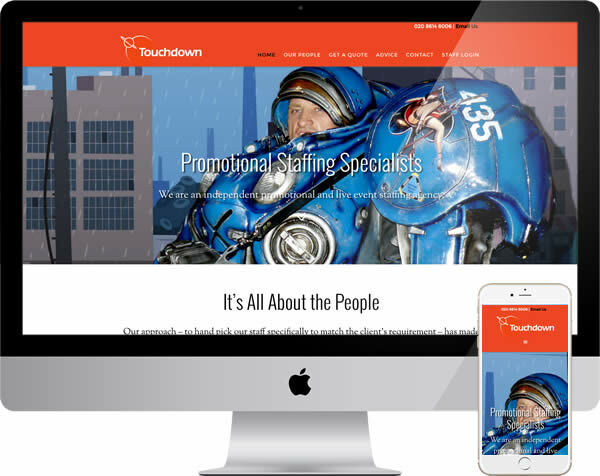 Brief – Touchdown are a respected, specialist staff agency. Providing event, or promotional staff, brand ambassadors and much more. Their existing website had become dated and unsuited to modern devices. The company also wanted an online image more in keeping with their brand guidelines and able to make a greater impact. Beyond web design needs, technical issues were raised, not least a significant loss of visitors from Google. A few months before our discussion, search traffic to the existing site had halved and remained there. Technical & Search – We carried out a technical audit of the current website, identifying a number of issues. These ranged from poor indexing control, causing internal duplication, to accidentally hidden text. Along with other factors, they encouraged algorithmic devaluation from Google. A plan was created to ensure unwanted elements would be replaced by technically efficient, search friendly options. As our client would be managing the site themselves, the report highlighted required operational changes. Helping them move forward, once the new website provided a clean base to work from. Design & Build – A device friendly, responsive design would be essential, along with the immediate impact our client requested. Matching the site to existing brand colours and contrasts helped, along with strong, on subject imagery. Giving visitors a picture of an ability to meet their needs and the quality of staff available. Text colour, fonts and headers continued the principle of strength and clarity. Part of creating a website which was accessible, easy to use for people in a hurry and focused on information they wanted. Outcome – The cleaner, simpler website clearly pleased clients, from their on site behaviour and response. Notable progress has also been made on issues with search placement. Traffic is improved, on topic and still growing. The new site provided a sound business platform and a basis for building a sustainable search presence, with concerns about Google devaluation removed. By all means take a look at further examples of our work, along with information in our introduction to web design. Or get in touch with us, if you would like to discuss your own project.